Daniel Kass was born September 21, 1982 in Pompton Plains. Danny and his brother Matt got hooked on snowboarding in their early teens at the Hidden Valley and Mountain Creek ski resorts in the northwestern part of the state. Seeking increasingly challenging slopes, Danny ended up in Vermont at Okemo Mountain, which boasted one of the top snowboarding and freestyle schools. It was here that he developed his smooth signature style, and his trademark trick, the Kasserole. 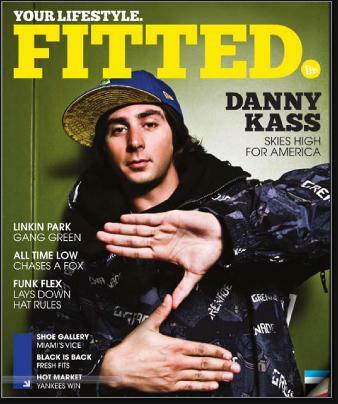 By age 18, Danny, self-coached, was one of the top snowboarders in the country. Danny won gold in the superpipe at the 2001 X Games, captured one of his four US Open titles and finished first on the Chevy Grand Prix circuit. At the 2002 Winter Olympics in Salt Lake City, Danny finished second in the halfpipe to his friend Ross Powers. He nailed back-to-back 1080s during his runs. The silver medal was one of 34 won by the U.S. With Jarret Thomas taking the bronze it was the first medal sweep at the Winter Games for the US team since 1956. Danny continued to compete on the US Grand Prix circuit in the halfpipe, slopestyle, and superpipe with an eye toward gold at the 2006 Olympics in Italy. In Torino, he had the top qualifying run but, this time, he ran into Shaun White, who finished ahead of him in the halfpipe, resulting in a second silver medal. Danny and his brother capitalized on his fame by forming an extreme sports apparel and accessories company called Grenade Gloves. In 2008, Danny was featured with fellow snowboarder Lucas Magoon on Fuel TV’s The Adventures of Danny and The Dingo. He did not make the 2010 Olympic team.